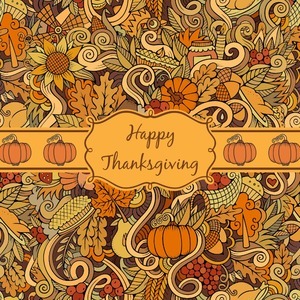 This beautiful thanksgiving design is hand drawn and includes many thanksgiving as well as fall traditions. The design colors represent all the beautiful fall colors of brown and orange. We have this pattern available to you in two colors - one is in the classic fall colors of browns and oranges, while the other background is brighter and also includes more reds and greens. We have chosen to use the more classic colors - however, it is super easy to make the change in our customization system. We also chose our newest ribbon - which is a build on the classic ribbon and can include any graphic - and so we chose the pumpkin. We chose the curly label with "Happy Thanksgiving" for our personalization.